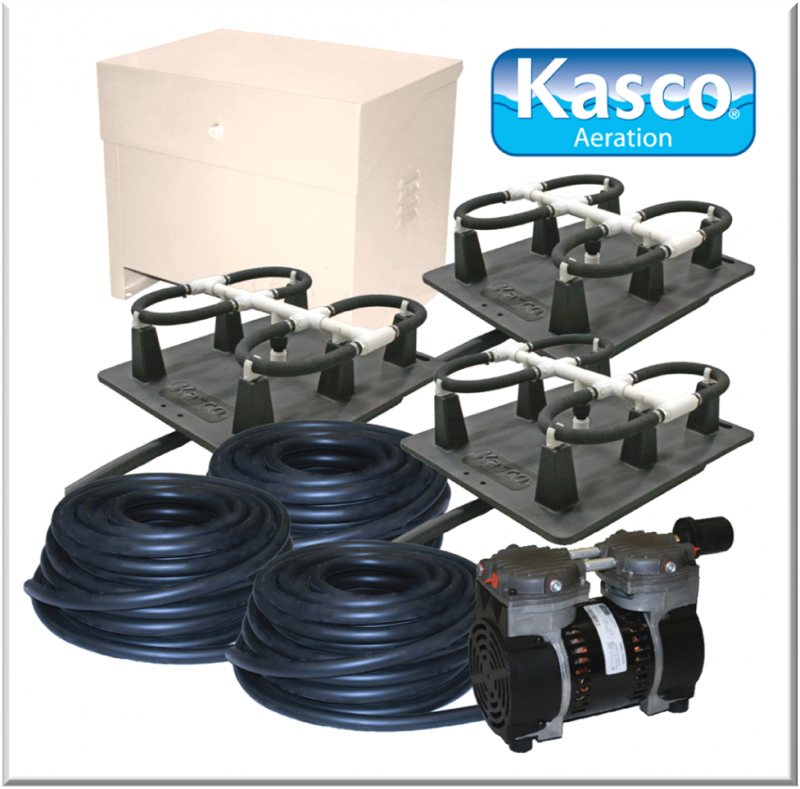 The Robust-Aire RA3 system includes a rocking piston compressor, 300 feet of 3/8 inch Sure Sink weighted tubing, and three (3) Robust Aire diffuser assembly. 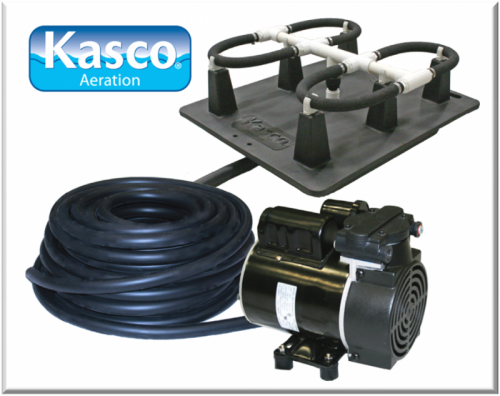 Robust-Aire diffusers are the most efficient on the market and create more water flow to aerate your pond. Diffusers are designed to provide a fine air bubble with the least amount of pressure. The base is made of durable plastic and a locking fill plug allows you to fill it with gravel or other weighted substrate. It has a raised design that keeps the diffusers performing at an optimal level above the pond bottom. A durable, bolted, strain relief attachment insures that the weighted tubing will not become detached during installation or maintenance. A check valve with Viton seals keeps water from entering the tubing when the system is not operating. Option #1 – No Cabinet (NC): This is desired when you want to install the compressor system in your own structure. Compressors need to be kept out of the weather in a ventilated area. Remote manifold is easily mounted via wood screws. Option #2 – Post mounted cabinet (PM) is mountable on an exterior wall or wooden post. Dimensions 19″ x 12″ x 12″H. 120 volt receptacle or a 240 volt junction box. A single cooling fan provides 110 CFM ventilation. Compressor is mounted at the factory in the cabinet which is provided with acoustical foam and a keyed cabinet lock. Option #3- A large base mount cabinet is included as the default method for the system. Compressor is mounted in the keyed, lockable cabinet. Sure Sink weighted tubing is available in easy to handle 100 foot coils. RA systems 1-3 include 100 feet of 3/8 tubing for each diffuser. Each coil is boxed and includes our full packet of barbed connectors and adapter fittings, and all-stainless steel tubing clamps. You will be prepared to make any connection necessary with the tubing kit. 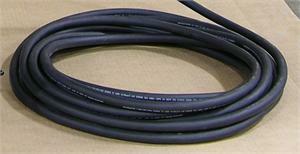 Additional 3/8″ or 5/8″ SureSink weighted tubing is available when additional length is needed. provide efficient, continuous-duty operation with minimal maintenance and quiet operation. Units are extremely quiet. Safely starts under pressure. Maximum operating depth 40 feet. Warranty: One year complete warranty on all parts.